Tall Horse, which recently played at the BAM Next Wave Festival, opens with a view of the storage space of the Musée National in Egypt. On a set of tall shelves, we find boxes, tools, and sundry objects and fragments. The show is framed as a history lesson: a Parisian of African descent arrives at the museum to find the roots of his ancestors' migration to France in the early 19th century. Part of this lesson is a preachy lecture on the French Enlightenment and its search for exotic cultures, a somewhat diligent combination of Michel Foucault and Edward Said. But this critique of orientalism does not run very deep, for the show itself celebrates cultural exchange on every possible level. It tells the story of a giraffe which is transported 7,000 miles from Alexandria to Paris, a gift from the Pasha of Egypt to Charles X, King of France. This gift is not a pure act of friendship, but a ploy in a high-stakes diplomatic game through which the Pasha wants to turn the King against the Greeks. The cultural exchange is anything but benign. 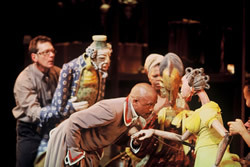 The makers of Tall Horse, however, are rather undisturbed by power politics in part because their production is premised on exchange as well: it is a unique collaboration between the renowned South African Handspring Puppet Company and the Sogolon Puppet Troupe from Mali in northern Africa. Indeed, these two African companies take their artificial gigantic giraffe on a tour of their own, exhibiting it to gaping audiences around the world. They, too, are trading in curiosities, and they seem to enjoy themselves in the process. 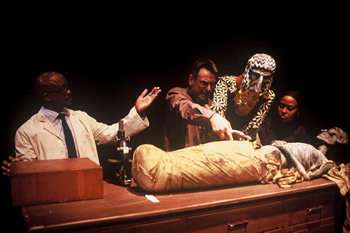 The centerpiece of the opening scene is a mummy, a piece of dead matter. Animating dead matter is the true purpose of this show--an animation fueled by an exchange in puppetry. Tall Horse is a play with puppets but also a play about puppets, an experiment in cross-cultural puppetry. 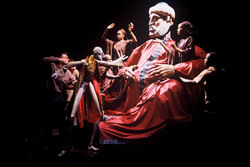 The Handspring Puppet Company has a long history in innovative puppetry, including Ubu and the Truth Commission (1998), an adaptation of Alfred Jarry's Ubu Roi, as well as Claudio Monteverdi's Return of Ulysses (reviewed in Hotreview.org in 2004). The Sogolon Puppet Troupe works with more traditional puppets, in particular simple but compelling rod puppets as well as antelope puppets with fringed skirts. The result of this collaboration is a marvelous panoply: huge puppets such as the Pasha of Egypt or the King's wife; small puppets representing children; rod puppets creating the impression of crowds; a diplomat whose long thin legs develop a life of their own; and a whole zoo of animals, including antelopes, a ferret, and, of course, the giraffe. The theme of the show, cultural exchange, is thus translated into a breathtakingly varied inventory of puppets. The two companies practice their puppet trade almost to a fault; there are perhaps too many different types of puppets populating the stage. It is almost impossible to make sense of the multiplicity of styles and modes, colors and shapes. In particular the Malian antelope puppets seem to pop up at odd moments, including at the court in Paris, without preparation or explanation. It's almost as if the performers and puppeteers had too much fun exchanging styles and techniques. In the end, however, Marthinus Basson, the show's director, Adrian Kohler, the main puppet maker of Handspring, and Yaya Coulibaly, the main puppet maker of Sogolon, manage to turn their rich cultural resources into a compelling meditation on puppets. There are three species to be found in Tall Horse: human actors, human puppets, and animal puppets. The dynamic interrelations among these are the true drama of this show. Handspring and Sogolon are masters of animation, but what makes Tall Horse special is that the animation works both ways: puppets often animate human actors. One such scene occurs when the French wife of a Marseilles notable, a puppet who has taken a liking to the human giraffe caretaker, teaches him how to waltz. Another example is the way the giraffe leads fashionable Parisian society to imitate it, an effect beautifully achieved through the long-necked Malian rod puppets. The animation of puppets (and of humans) is a matter of grace, but also of power. The huge puppet of the Pasha of Egypt, for example, is animated by a whole host of puppeteers. The King of France, though much smaller in size, is surrounded by a number of attendants, only some of which are puppeteers. These two royal puppets command these puppeteers, who double as their underlings. The connection between animation and power is made clear at the climax of the play, when the giraffe is finally brought before the King. Even though the King is small (much smaller, for example, than his wife, who is jealous of the giraffe and wants to turn it into food) and truly in awe of the animal, he becomes a sovereign animal trainer, commanding the giraffe and three antelopes in a final dance. For all its parody of French society, including its monarch, Tall Horse thus leaves the power of the King untouched. This monarchist streak is suggested early on when the giraffe and its entourage encounter revolutionaries in Lyons. The revolution's main purpose, it seems, is to guillotine the poor giraffe, and the animal barely escapes. Only after such hazards have been overcome can the giraffe, which is repeatedly called a "regal" animal, reach its true destiny and become directly subservient to the king. Even though pretty much everyone, except for the bad revolutionaries, is busy protecting the giraffe, the show is not overly concerned about the animal's welfare. The giraffe is treated as important only insofar as it is a gift in a political gambit. Early on we see the mother of the giraffe get hunted, wounded, and killed. The young giraffe grows up in captivity. The difference between the wild giraffes and the captured one is expressed in different styles of puppetry. The parent giraffes are represented by single performers on stilts, two-legged creatures that move swiftly and gracefully across the stage. The captured giraffe, whose main feature is its sheer size, has a huge frame that barely fits the large stage of the Harvey Theater. Indeed, the performance briefly relapses into a Foucauldian mode when the French professor goes about measuring every extremity of the enormous creature. The giraffe is not only large, but also clunky, something of a machine that creaks with each awkward step. The only part of this puppet that can move with some elegance is its long neck, a movement performed to excess at various moments in the show. At the very end, after learning that all of Paris is imitating the giraffe, we are left with an image of the Eiffel Tower, an apt comparison as the giraffe is indeed a kind of animated architecture. If the main point of the show is to endow this construction with a soul, an anima, I am not sure it succeeds. If the point is to stress compulsion through size and engineering prowess, however, that works, as we gaze incredulously at this Trojan horse of sorts, which may harbor one or several humans inside its large belly. There is one relation that functions seemingly outside the question of politics and diplomacy, namely that between the giraffe and its caretaker, Atir. They alone truly understand one another, and in the end Atir chooses to remain with the animal in Paris rather than return to his village. The show ends with the giraffe gently kicking the sleeping Atir, as if attempting a final act of animal-human animation. Atir moves a little, but falls back asleep, leaving us to ponder that huge mechanical creature, brought all the way from Africa not only to Paris but to New York. Who could fail to be impressed by the accomplished puppetry, the fertile exchange of cultures, and the power of animation. But we are also left to wonder what kind of lesson we can take away, a lesson not so much about the French Enlightenment, curiosities and diplomacy, but about the act of animation itself, from which this show derives its pulse. This animation has a limited understanding of animals. Its plot is too confined by a conception of animals as something to marvel at, trade, give as gifts, transport over large distances, and put into the royal menagerie. Of the three species--humans, human puppets, and animal puppets--the latter occupy the center of attention, but not the center of animation. One is left wondering what it would look like if the regal animal took over and in turn animated human puppets and human actors.